Some people in the hunting world like to dump on Canada Goose meat. Call it contempt for the commonplace, or maybe they’ve just had poorly-prepared meals, but I am a staunch apologist, nay a champion, for the bird as table fare. I love Canada Goose meat, and I’m not too ashamed to admit it anymore. Properly-cooked Canada Goose (and I can’t overstate that term enough) is great. Improperly-cooked Canada Goose is a crime. Early-season geese that are pin-feathered or that lack a good layer of fat are ideal for butchering into “breast steaks”. When it is done correctly and simply (spoiler alert: it isn’t that hard) it eats like a good cut of beef, and our favourite way to cook goose breasts is to treat them just like a steak and do them on a good, hot grill. Of note is that the heat and times I mentioned below work for my grill on room-temperature goose breasts of average size. Over years of doing this I know that these temperatures and times will give me rare to medium-rare meat, which is how I like it. 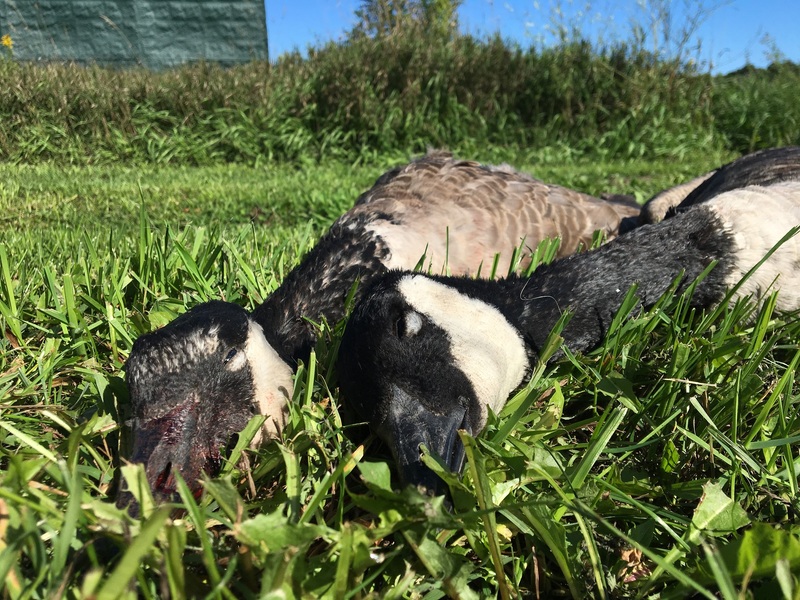 If you’ve shot a huge goose, you may want things to be on the grill a bit longer, if you’ve got a bunch of smaller juvies, lessers, or cacklers, then shorten up the time. IT IS COMPLETELY OKAY TO EAT GOOSE BREASTS MEDIUM-RARE. I cannot stress this enough; if you cook a goose breast to anything past MEDIUM (i.e. no longer warm and still a little pink, but brown-grey throughout) you are probably not going to enjoy the experience as things get chewy and grainy and dry. I am of the belief that medium-well and well-done goose breasts have contributed to more people labelling Canada Geese as ‘trash’ than anything else. When I make this, I treat it like a nice steak. With red wine, asparagus, and a salad as a dinner, or served cold on toast with tomatoes and a fried egg the next morning, grilled Canada Goose should be in your recipe book. Whisk all ingredients together and pour over the goose breasts. These measurements make enough to ‘cover’ two breasts in an 11 x 7 x 1.5 inch glass casserole dish. Scale these measurements up or down depending on how much goose you are grilling. Let the breasts soak for anywhere from 6 to 24 hours. Heat your grill to a high temperature (mine was holding between 550 and 600 degrees Fahrenheit throughout cooking). Remove the breasts and let most of the marinade drain off, but do not pat them dry. Place the goose breasts on the grill and close the lid. After 3 ½ minutes, give the breasts a quarter turn, but do not turn them over*. After 3 ½ more minutes, turn the breasts over. After 3 minutes give them another quarter turn. After three more minutes, remove them to a plate or a rack. Let the goose rest uncovered for 5-10 minutes. Slice the meat into strips across the grain and serve warm as you would a steak. *I like to do this because it makes nice cross-hatch grill marks. If you do not care for this, then do not make the quarter turns and just do 7 minutes on one side, then flip the breasts and do 6 minutes on the other. If you are unsure of how “done” they are there’s no shame in giving them a quick slice and deciding if they need more time to reach your desired level of cooking. Previous PostSpicy & Crispy Goose HeartsNext PostPiles Makes Smiles…Or Do They?